01What is lateral canthoplasty ? 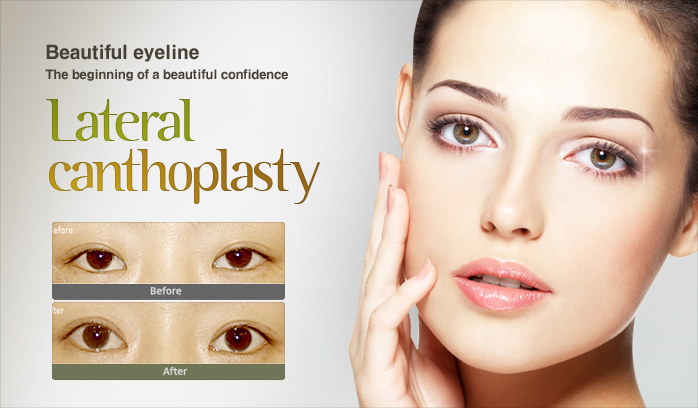 Examples) Magic epicanthoplasty, ptosis correction and double eyelid surgery combined with lateral canthoplasty. Examples) Magic epicanthoplasty combined with lateral canthoplasty. Examples) Magic epicanthoplasty and incisional double eyelid surgery combined with lateral canthoplasty. This patient wanted to have images similar to those of Caucasians. Different with the Westerners, Asians have a raised tails of eyes, called a 'Mongolian inclination'. Inclination of eyes is made by the outside eyelid ligament and the inside eyelid ligament, and the angle made by this line is called the inclination of the eye. This angle is about 10 degrees for Mongoloid races and 5-8 degrees for Westerners, and when it is over 15 degrees it may look severe and give a sharp impression. In this surgery, the tails of eyes can be pushed down by extending width of eyes. This will therefore result in softer looking eyes. It is an operation to extend and further open the tails of the eyes to make your eyes look larger. And also its undergone when correcting the eyes which have a sharp impression caused by the raised tails of eyes. We perform it by dissecting the skin after incising the tails of eyes and rearranging its position. Poor lateral canthoplasty can cause the eye to have a scar or cause it to result in a bad shape. Although the tail of the eyes can extend up to 2mm, it must be accurately determined after a physical examination and consultation. Is there any relationship between a double eyelid and a lateral canthoplasty? Unlike epicanthoplasty, there is no relation of a double eyelid with the lateral canthoplasty. Lateral canthoplasty is optional because it has no difference whether it is taken with a double eyelid surgery or taken separately from it. In most cases, undergoing the Magic epicanthoplasty gives you larger eyes than undergoing the lateral canthoplasty, so the epicanthoplasty is considered as more of a priority. Epicanthoplasty, a procedure of removing the Mongolian fold which is not a necessary structure, is a safe surgery without any considerable side effects in terms of function and structures on the eyes. In case of the lateral canthoplasty, it is an operation which requires the surgeon to interfere and impair some parts of the eye's structure. Also, in lateral canthoplasty, opening and inscising over 3mm can make your eyes very unnatural and can cause them to have functional problems. Is it possible to get back to my previous state after lateral canthoplasty? Eyes in which the eyelid hangs down and the eyeball is depressed have low position of parts combined with upper eyelid and lower eyelid. By lateral canthoplasty, parts opened can be attached again. However this is not recommended because it can create visual problems for the eyes. Will a scar remain after lateral canthoplasty? In lateral canthoplasty, a suture is made in parts of the skin with the conjunctiva (which is the waterline) and then a scar is hardly seen. And even though swelling is rare, the patient is encouraged to let the swell is with an ice pack for 1-2 days (the swelling period will differ depending on the patients’ conditions.) Stitches are sewn with a very thin thread and they are expected to take treatment the day after the operation and come again totake out the stitches after 5 days.